Magical eyes was a well written magic adventure book that I really enjoyed! Princess Martina was my favorite character by far! I just really like her determination in the face of adversity. I liked the whole idea of magic not being accepted as it set the book apart from most fantasy books. The book reminded me a bit if a Harry Potter, Merlin, Amber fusion. It had all the best elements of a fantasy book while still having unique characters and its own awesome plot. This is one extraordinary adventure. The distinctive characters and descriptive scenarios can easily captivate readers of all age. But beyond that, the writer ingeniously adds lovely life lessons about family values, social justice, and perseverance. These are concepts that are always good to remind society and especially our children and teenagers. The colorful cover and each of the pages leave you with the desire to read more. A brilliant idea of bringing the characters to life with their portraits at the end of the book! You can easily relate to them during the reading. Jessica's unique imagination has definitely created a new princess “Martina” for all Disney lovers. Looking forward to having the opportunity to read part II of “Magical Eyes”. The story is a "gem" that I am pretty sure will become a classic. Princess Martina has magical powers she must keep hidden. For she lives in a land where if her skills were to surface, it would mean they would not be accepted. She discovers a true friend in Enzo who is a peasant boy. Then her world is turned upside down when tragedy strikes Brightalia. Overnight her calm and peaceful world is torn to pieces. She feels that if she and her brother could set aside their differences they could help save the land from the destruction that is assured to follow. Will Martina try to work with her brother to save Brightalia? Or will she decide that her friend is the better choice? In trying to save the kingdom, will she find that she is putting herself in a path of destruction? Magical Eyes: Dawn of the Sand is one spectacular adventure. From page one, you find yourself caught up in the high action drama. The setting and characters are so artfully created. Each one offers his own special blend to an unforgettable and delightful fantasy. Jessica D'Agostini should be commended for writing such an outstanding book. From the richly illustrated cover of the book, you find yourself drawn into a world where magical mystery exists. You discover a world that is in turmoil. What makes this book so unique is that it will appeal to both young adults and adults. I can see it easily be read by a parent to her child and know that both of them will enjoy the adventure. This book ranks right up there with the beloved Disney movies that I grew up with and loved. Great story from beginning to end, bound to keep the young reader entretained. Filled with an exciting plot and lots of adventures. When was the last time that you were captivated by a charming book with enchanted kingdoms, giant white eagles and princesses with special powers? 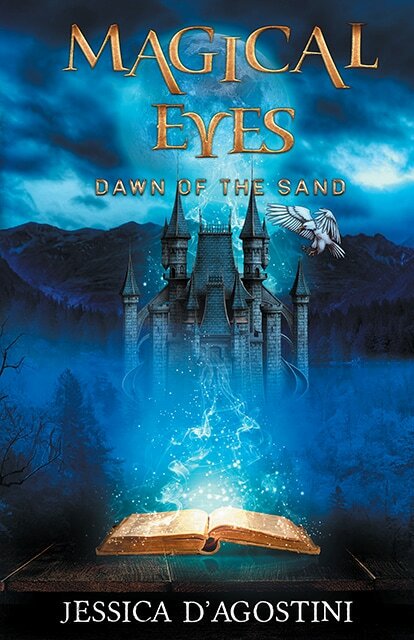 At the beginning, I was under the impression that “Magical Eyes – Dawn of The Sand” was just a children’s book easy to read. I appreciate to see that it’s not just about that – the author managed to combine the adventure, mystery, and the intrigue with a lovely dose of innocent life lessons about friendship, family, and the courage to be your true self, which left even me as a grown-up with a great deal to think about. This is the kind of story that I imagine reading to my children every night before we go to sleep and I kindly recommend it to everyone who needs a bit of magic in their own lives. It’s a book where both the reader and the listener will find something to appreciate! At first glimpse Magical Eyes is full of mystery, anticipation and of course, magic! But beyond all that wonderful action is a story about courage, love and learning to accept ourselves for who we are, regardless of what others might think. Like all great stories, this novel is founded upon fantastic themes that will provide wonderful lessons for young readers. I highly recommend. What a fantastic book. I really enjoyed reading this book. Jessica D'Agostini did a beautiful job of bringing the characters to life.The book is well written from the beginning to the end. Excellent story-telling, vivid characters and a terrific side-kick. Another epic story from a great writer. Highly Recommended book.